I got the pleasure to work with Tiffany McClain of Mimi’s Cafe to do the illustration work for their new kids menu and activity sheets to be used across their 84 restaurant locations. 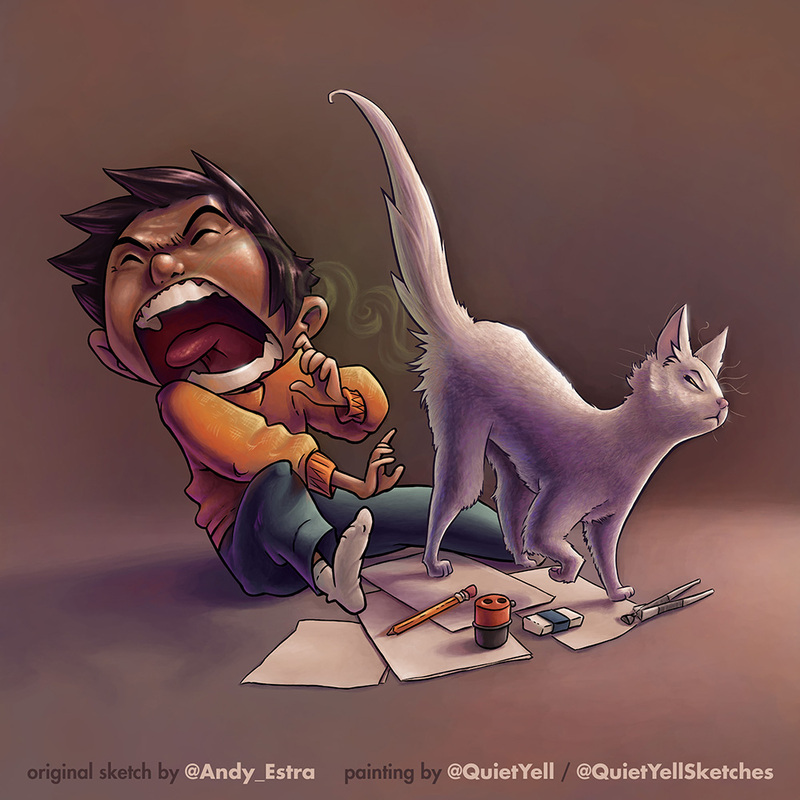 I am excited to finally be able to share this work! Below is the press release with the PR image followed by a thumbnail grouping of the images I did for the menu and activity sheet that has been made public thus far. DALLAS, Feb. 27, 2018 /PRNewswire/ — Mimi’s has launched a creative new kids menu that features healthy choices and an entertaining experience to make ordering fun for even the youngest diners. 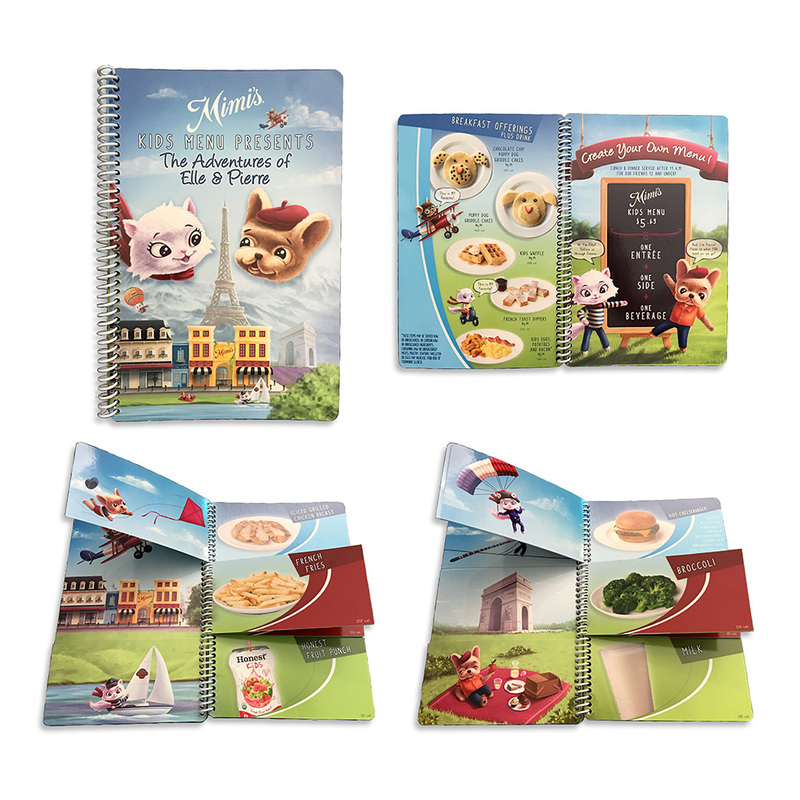 The flipbook-style menu is a charming storybook starring Elle and Pierre, a cat-and-dog best-friend duo traveling through France together. 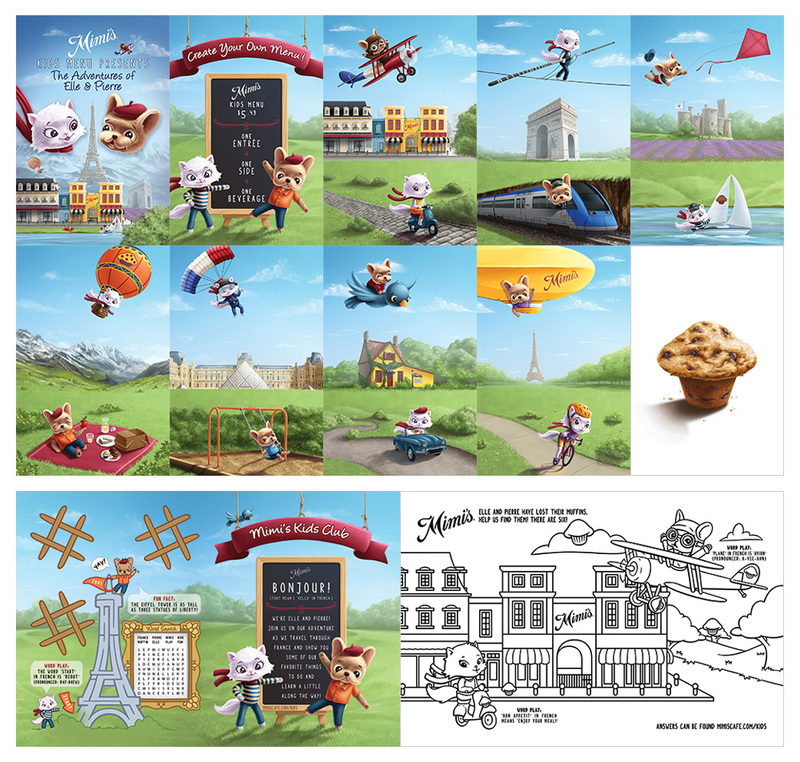 The pair help kids select a main dish, side and drink, with each turn of the menu’s three-part pages creating a new scene in the French countryside or city, as Elle and Pierre enjoy picnics, riding trains, dancing – even parachuting. 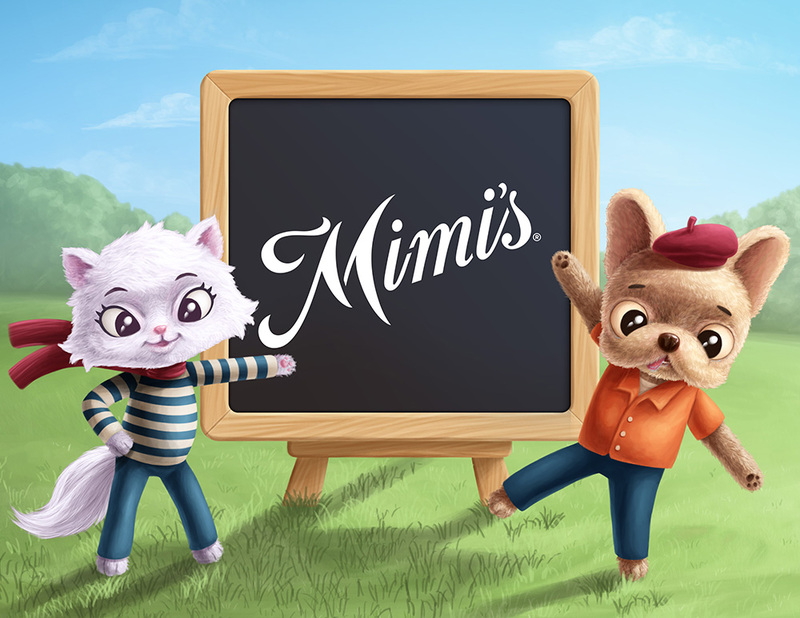 “GoGo squeeZ is thrilled to partner with a fun and exciting brand such as Mimi’s. Our mission at GoGo squeeZ is to make it easier for families to be healthier and happier. We hope kids will be excited about this addition to the Mimi’s kids menu,” said GoGo squeeZ Chief Marketing Officer Helene Caillate. The entire kids menu is available all day, for kids 12 years and younger. Mimi’s also offers all-day breakfast, every day. For a full menu, locations and hours of operation, go to www.mimiscafe.com/kids. Founded in 1978 by Arthur Simms, who was stationed in France during World War II, Mimi’s is a neighborhood cafe offering fresh, hand-prepared American-French comfort food and bistro classics for breakfast all day, lunch, dinner and special celebrations. Now owned by Dallas-based Le Duff America, Inc., the North American subsidiary of global bakery-cafe leader Groupe Le Duff, headquartered in Rennes, France, Mimi’s has 84 locations in 16 U.S. states. Mimi’s sources the freshest ingredients, inspiring its scratch-made French bistro classics and American comfort food. A full menu and more information is available at www.mimiscafe.com. 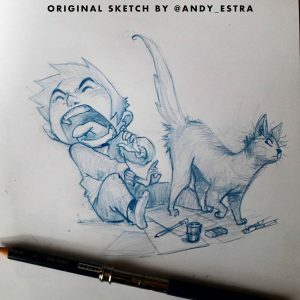 Visit Instagram.com/Andy_Estra for a constant flow of great work! We can learn much about how a historical period viewed the abilities of its children by studying its children’s literature. Occupying a space somewhere between the purely didactic and the nonsensical, most children’s books published in the past few hundred years have attempted to find a line between the two poles, seeking a balance between entertainment and instruction. However, that line seems to move closer to one pole or another depending on the prevailing cultural sentiments of the time. And the very fact that children’s books were hardly published at all before the early 18th century tells us a lot about when and how modern ideas of childhood as a separate category of existence began… Enter the Baldwin Library of Historical Children’s Literature here, where you can browse several categories, search for subjects, authors, titles, etc, see full-screen, zoomable images of book covers, download XML versions, and read all of the over 6,000 books in the collection with comfortable reader views. Find more classics in our collection, 800 Free eBooks for iPad, Kindle & Other Devices. 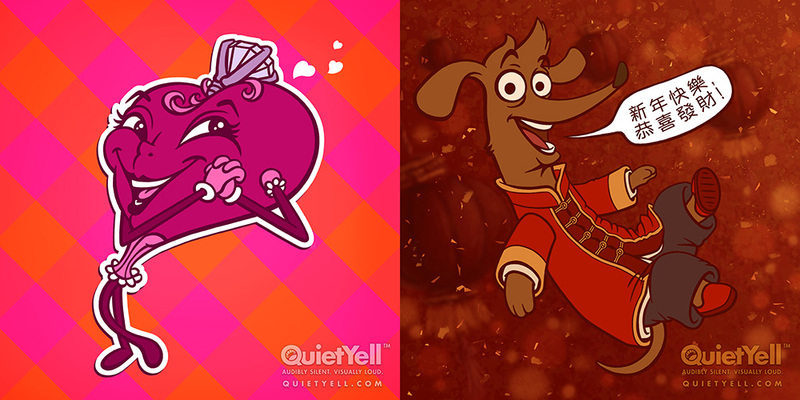 May your Valentine’s Day be rich with love… and 新年快樂, 恭喜發財! 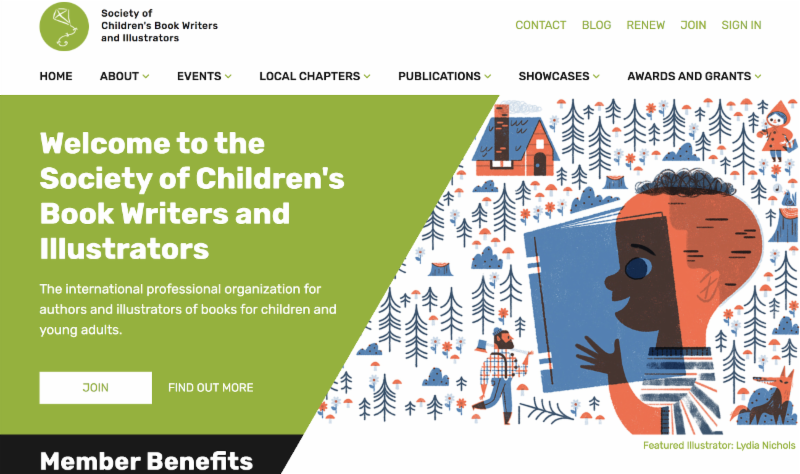 In January, Kidlit411.com offered the opportunity to illustrate the banner for their site, Facebook group, & Twitter Profile. 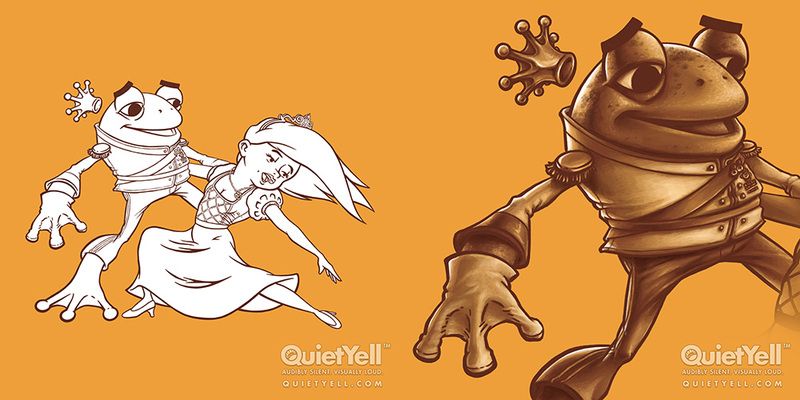 Below is the banner I created for them. It focuses on the frequent interviews of children’s book authors & illustrators and the diversity found within the kidlit industry. 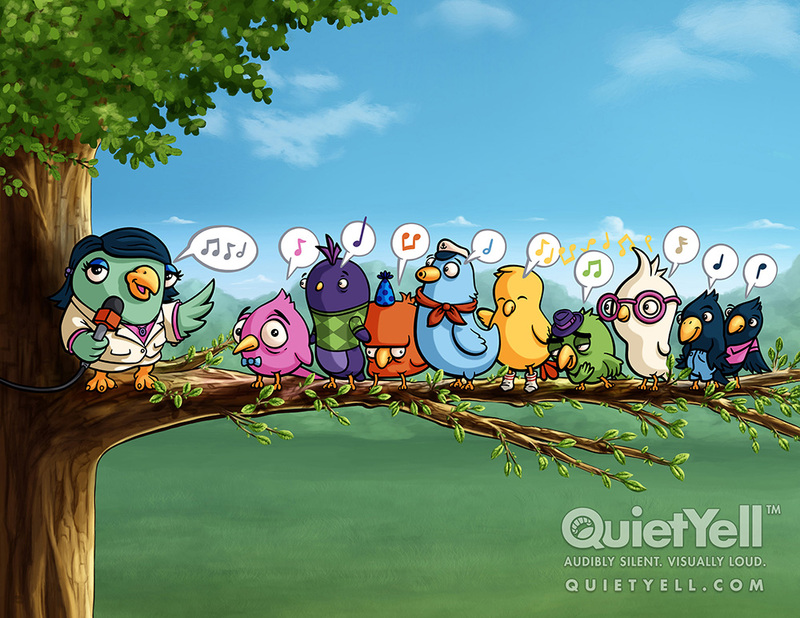 Following is the full illustration in its non-branded form (Note the way the handling of the music notes correspond to the bird speaking them). This past year, I wanted to immerse myself into visual storytelling in movies, so we watched quite a few movies (88 to be precise). Hope I learned something, but at least I enjoyed this research! While we rented some from GooglePlay and through our Amazon Prime Video, to our delight, we realized that we could check out many movies (even just released to dvd) through our local library! Nothing like watching movies for free! As a side note & a little insight to me, I am not fond of watching movies at the movie theater as I find it inconvenient & discomforting (in fact, I can’t quite remember how many years ago it has been since watching a movie in the theater). Watching at home allows me to pause as needed (use restroom, get something to drink/eat, look something up, talk about what was shown, go do something and come back to the movie hours later, etc. ), rewind (usually to clarify what was said/shown or re-listen/re-see if distracted when in natural play), and simply to relax (lay down, wear very casual clothes, talk & use smartphone more freely during the movie, sketch or do work during the movie, etc.). Oh, and it’s a whole lot cheaper! …hmm… “Nothing like watching movies for free!”… “it’s a whole lot cheaper!”… Well, I sure sound like a cheapskate! — haha — I’m not, but if I can get something at a lesser cost (especially if I find the lesser cost version to be better), then why pay more? I also enjoyed the Planet of the Apes Trilogy, the Star Wars movies, and The Spiderwick Chronicles; though, I’m not sure if they make it to the “Favorites” list. Similarly, I was pleasantly surprised that I enjoyed the mix of 3D, 2D, etc. in The Peanuts Movie; it was something I was skeptical & critical of before watching it but actually found it to be an appropriate and endearing approach. Maybe I’ll make some people upset here, but I did have some unexpected disappointments with some movies that had a lot of critic, industry, and public “fanfare” (Note: This doesn’t mean that I disliked the movies all together, for in fact, there were various great things about them) : Logan — While I liked the gritty, dusty & somewhat realistic style of Logan, it was far too violent/angry/aggressive for me. Wonder Woman — This had fun action sequences & exciting special effects, but while it was nice to see the Wonder Woman character being physically strong as well as compassionate, I found her to make key decisions based off of emotion rather than thoughtful strategy & such; thus, I didn’t find her to be quite the best role model as the character was praised for being, particularly for encouraging STEM, leadership, etc. La La Land — This just seemed to have unending praise heaped upon it, but I found it quite forgettable; however, I must say that I very much so liked the color usage, sets/scenes & the compositions of them. The live action versions of The Jungle Book and Beauty & The Beast — Both of these were visually wonderful with great production quality; however, they not only didn’t live up to the original cartoon versions for me but seemed to be lacking something (perhaps it is just my own nostalgia). I look forward to hopefully watching many more movies in 2018 & beyond (and continuing to read many more books too!) — Library time!